Is Defective by Design getting any traction at all? 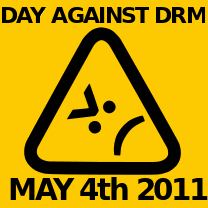 May 4 is the "Day Against DRM": Did you notice? What if they gave a protest, and nobody came? The Free Software Foundation (FSF) is calling May 4 the "Day Against DRM," but is it getting any traction? From the look of its 2011 wiki page, not very much. You'd think that an anti-DRM day would be a pretty easy sell. Digital Restrictions Management (the entertainment industry would call it "Digital Rights Management," but I'll side with the FSF here) is tolerated at best — and hated by many. I've never talked to anyone, no matter how computer literate or illiterate, who thought a scheme to lock their content to specific devices so it couldn't be shared or transferred to different devices was a great idea. Despite the easy sell, the FSF doesn't seem to be getting much traction with its campaign. On its wiki, there's exactly one event listed, and four posts about the event. The FSF has one monumental problem that it can't solve, and that's budget. It would be much easier to get the word out if the Defective by Design campaign had big bucks behind it, but that isn't going to happen — the FSF needs to conduct a low-cost campaign that spreads by word of mouth. The current campaign isn't it. One of the problems that they have, that could be solved, is lack of organization. I received a note about the "day against DRM," exactly two days ago. It looks like they've tried to mobilize their audience around the same time — at least I see no evidence that they've been working on this for any amount of time, this year. If you have a campaign that depends on organizing volunteers, you need to start early to give them plenty of time to get fired up and start planning. The "fired up," is a problem as well. The DBD campaign materials have that embarrassing college radical feel, which isn't likely to rally anyone who's not already on their side. The "Mr. Yuck," impersonator in the logo and terrible puns ("the iPad is iBad") may work for the radical nerd population — but it's not going to catch on much outside that group. If preaching to the converted is the goal, then their existing materials are fine. If they want to appeal to users who are outside the traditional FSF-supporter circle, they need to revamp the way they approach the anti-DRM message. The anti-DRM messaging may have lost a bit of urgency as well, because DRM is becoming less of an issue for many users. As more people move to streaming media for their video collections, DRM is less visible. When you don't own the content physically, it's hard to make an argument that the material shouldn't be DRM'ed. Most of the music that's sold today is offered without DRM as well. The only growth area for DRM at the moment seems to be eBooks and mobile applications. The mobile apps are already non-free for the most part, so users aren't likely to care so much that they're DRM'ed. The eBook DRM stinks, but most users haven't run up against a legitimate (non-infringing) need to move eBooks from one DRM device to another. That'll happen when Kindle or Nook users want to move from one to the other and realize their existing eBook collection is still tied to their former device. So content ownership, which is at the root of the DRM problem, is a moving target. The FSF's campaign doesn't do anything to address the larger issue — just a symptom of it. Why do I care? The thing is, I agree with the FSF that DRM is a bad thing — and the larger issue of content ownership is worth addressing sooner rather than later. We have less and less control over the music, movies, literature, and applications that we're using. This is one of the reasons I support the Electronic Frontier Foundation and its more comprehensive efforts to "preserve balance and ensure that the Internet and digital technologies continue to empower you as a consumer, creator, innovator, scholar, and citizen." Compare the two sites, the materials available, language used, etc., and ask yourself which method is more likely to succeed. The "Mr. Yuck," approach isn't cutting it.